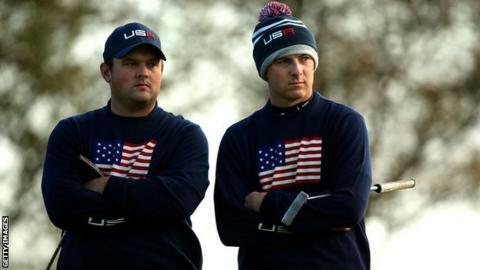 Ryder Cup success with a "young, fiery" US team is a top priority in 2016 for world number one Jordan Spieth. The 22-year-old American will defend two major titles - the Masters and US Open - this year. But he insisted the biennial team competition was "possibly at the very top of the list" after six US defeats by Europe in the past seven contests. "We're tired of hearing about the past," said Spieth, who believes young players have "less scar tissue". "We're going to go in believing that it's just a completely clean slate," he added. The 2016 Ryder Cup begins on 30 September at Hazeltine, Minnesota, with Europe defending the trophy they retained at Gleneagles two years ago. The 2014 edition was marked by acrimony in US ranks, as veteran Phil Mickelson publicly questioned the captaincy of Tom Watson in a press conference. The fallout from that defeat lead to the establishment of an 11-strong 'task force' to examine US Ryder Cup strategy and selection procedure. Davis Love III was subsequently appointed captain of the US team for the second time - despite presiding over the collapse at Medinah in 2012 - while Tiger Woods, Steve Stricker and Jim Furyk have been named as vice-captains. However, Spieth believes a more youthful line-up on the course, including the likes of Rickie Fowler, Brooks Koepka, Justin Thomas and Patrick Reed, can bring a new approach to the competition. "If we go in believing this is the inaugural event and we are ready to go and start a new trend, then I think we'll be fine," said Spieth. Last week, Spieth shot 30 under par to win the Tournament of Champions in Hawaii, and begins his first regular European Tour event - the Abu Dhabi Golf Championship - on Thursday, in a three-ball with Fowler and Rory McIlroy. With golf returning to the Olympics this summer, Spieth will be among the favourites for gold. However, when asked to rate the prospect of winning gold or another major, he said the value of Olympic gold would only emerge in time. "I think it will be unsure for 10 to 20 years how significant a gold medal will be in golf," he said. "If I had not won a major, I would probably still [prefer] a major. But a gold medal would be very, very special."